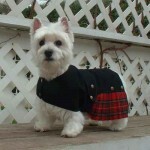 Show off your dogs in these wonderful one-piece coat kilts. They are very easy to put on even a reluctant dog with just one strap to be buttoned. They were made in England of 100% wool, and must be dry cleaned or cleaned with the Dryel home dry cleaning product. If you have any questions, please email Carole Beaudry . 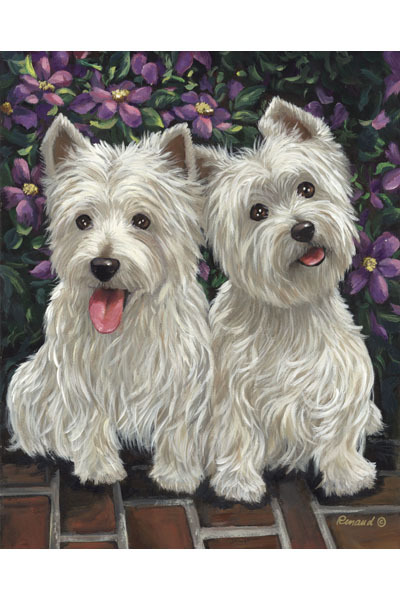 If you prefer to mail in your order, please email Carole Beaudry with your order details. She will then hold it until your check is received. Send the check to: Carole Beaudry, 8820 Tavistock, Plymouth, MI 48170. Our Kilts are popular around the world. 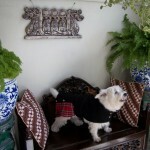 This one is being worn by a little Westie in Singapore!